To keep the work of theology at its proper task, and to keep the theologian from getting distracted, and to keep the main thing the main thing (which is, after all, itself the main thing), there are a couple of helpful rules to observe. They are pretty simple and obvious. Here they are: Make sure that every substantive theological statement is connected to God, and make sure every substantive theological statement is connected to the gospel. I’ve come to associate these two rules with two theologians who have died in the last couple of years: Robert Jenson (d. 2017) and John Webster (d. 2016). That’s the gospel rule. The other rule, which I primarily associate with John Webster, is the God rule. It’s hard to believe that theologians need to be reminded to talk about God, but we really do. It is unfortunately very easy to be drawn into all kinds of theological chatter about all sorts of topics. Webster declared his program to be “theological theology,” which was a strange way to remind himself and others that theology has to be about God at all times. Webster often said that theology was about (1) God and (2) all things in relation to God. To drive the point home yet again, he quipped, “Theology is about everything; But it is not about everything about everything, But about everything in relation to God.” Done right, theology is one long journey inside the doctrine of God, which just happens to be so expansive as to include all things in relation to God. The difference these two rules might make in carrying out the work of theology is this: any theological topic, no matter how small or detailed or partial it might be, is subject to dogmatic mapping. It can and should be located with regard to the major landmarks of the theological landscape. One way to locate a doctrine is to look to its immediately neighboring doctrines. But the main way is to locate it with reference to the two major doctrinal fields: God and the gospel. If we take Jenson and Webster as especially pure or striking advocates of the two rules, we could note the ways they agree and disagree, or gave each other fits of worrying about how to work with these rules. Webster increasingly wanted the doctrine of creation to exert more normative influence on all theological statements; Jenson often exerted himself mightily to ensure there was no leftover God for anybody to talk about anywhere except in the gospel. 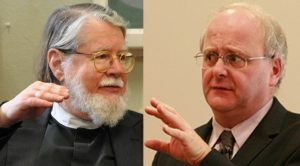 Their respective theological projects illuminate several of the possible relations between the two rules; both of these theologians worked under the influence of both rules. All theology ought to do so, and to draw out the consequences for every single doctrine in the entire field of Christian truth.